Dalia Atisha, CWPTM Has been planning, coordinating, designing and producing award-winning events. She has been planning weddings, corporate and social events from conception to completion for over 17 years. Dalia’s extensive background began in her early years in college beginning with her education in Business and Interior Design. Through the years during her studies, she gained experience with events while working for the Chamber of Commerce and newspaper networking and planning corporate events. Dalia continues her personal development skills through continued education in finding the latest trends and being involved with event networking organizations. The education she receives each year and the creative professionals she meets has helped shape The Event Planner, Inc. into what her clients seek providing them with exceptional professional service. She is an active member of the Association of Bridal Consultants (ABC) and International Live Events Association (ILEA) and has become an expert in the event industry. Her work has been published in many mediums from nationally known mediums like The Knot, being featured in local newspapers and live news broadcasts. She has also been awarded ‘Best Of Planner’ 8 years in a row putting her in the Hall of Fame. Moreover, she has also been nominated for awards Internationally. Dalia has an extensive diverse list of clientele from international destination weddings and High-Ranking delegates to NFL players. The events she and her team plan are unparalleled and fashion-forward exemplifying her client’s taste and style. On her free time, Dalia enjoys fashion, interior designing, the arts and embraces every moment of her time with her family. She is married to her high school sweet-heart (in fact that was her first biggest wedding she planned for 700 guests) she has 3 children, 45 first cousins, and 16 nephews and nieces and still growing…thus she always has something to celebrate which is what led her in finding her passion for planning events. Whether it’s an intimate event for 10 guests or an elaborate wedding for 600 or more guests Dalia and her team will ensure that your event will be what you envisioned all while providing you a stress-free professional experience, so you can enjoy every moment of it! Our event team are highly trained professionals and will provide a detail-oriented service that is tailored to your needs to make the day of your event smooth and seamless. Whether it’s a corporate gala, a lavish wedding or a social intimate event because details matter to us and we care about our clients to deliver exceptional events that have made us an awards winning company. Farah has been planning and coordinating events for over 10 years. She started in this industry as a part time event coordinator working for Dalia Atisha. Over the years, she’s coordinated weddings, corporate events and social events. Her love and passion of coordinating events is evident as she treats each event as if it were her own. Farah graduated from Wayne State University and holds a Bachelor’s in Business Administration with a major in Marketing. When Farah isn’t working she enjoys spending time with her family and friends. She enjoys cooking, networking and volunteering, among other things. 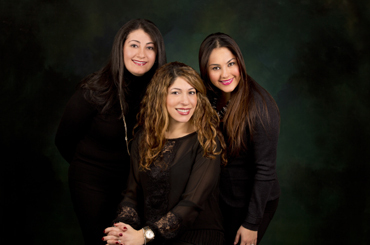 Farah is a member of the Birmingham Bloomfield Chamber of Commerce and the Chaldean American Chamber of Commerce. She is a member of the American Business Women’s Association-Novi Oaks Chapter and is co-chair for a couple of committees including their upcoming event, Night of the Stars Awards Gala. Some of her most recent volunteering efforts include: assisting in co-coordinating various events such as the Asian Pacific American Chamber of Commerce’s 15th Annual Gala, HAVEN Gala, and most recently with Global Health Charities.